The case for an SMR based energy park at Ceduna. As Adelaide gardens (and residents…) wilt in the first full-blown heat wave of the summer, here is a timely post from John Newlands to kick of the Decarbonise SA Summer Edition. In this post, John makes the case for a Small Modular Reactor (SMR) led development of nuclear in South Australia, beginning in Ceduna. As you will read, John has an eye on the limits SA is likely to be facing in water, and also gas and coal. It’s refreshing to read from someone who realises nuclear power has the potential to improve, not diminish, our water security. Should I be concerned that I feel John’s post presents more convincing forward thought about the industrial and ecological future of our state and nation that I have heard from any politicians in quite some time? – new industry and jobs for SA. The trigger for this thinking is what seems like the current roadblocks to the expansion of the Olympic Dam mine, the world’s biggest uranium deposit but primarily a source of copper, gold and silver. According to those specs the mine needs 650 MW of electrical power supply and a desalination plant on the coast that will produce 280 megalitres of fresh water a day, mainly pumped to the mine. The roadblocks are that the South Australian grid cannot readily supply that power and there is vehement opposition to the preferred near-landlocked site of the desal plant at Whyalla in upper Spencer Gulf. The narrow vertex of the gulf has elevated salinity and weak currents so the brine discharge would depend on tidal flushing for dispersal. It also the world’s only known mass spawning ground for the giant cuttlefish. SA as a whole is facing declining coal and gas supply. It is not clear how the extensive windpower which the State prides itself will fare when the gas situation worsens. Possibly Federal intervention would be needed to guarantee gas supply from Queensland as southern gas fields deplete. Meanwhile other energy hungry developments are in progress. These include rare earths and thorium extraction also at Whyalla, using ore railed from the NT. Another major development is zircon sand mining closer towards the WA border and this time coincidentally nearer the site of the Maralinga A-bomb tests in the 1950s. Those sands contain some thorium bearing monazite and will be shipped from Ceduna to Geraldton in WA for separation. The sands are mildly radioactive (not due to bomb tests) and will use the same loading facilities as wheat and gypsum. Apart from mineral sands the region has other prospective mines for copper gold, uranium and iron ore; all these new mines will need electricity and water supply. In my opinion the desal should be on open coastline rather than the stagnant waters of upper Spencer Gulf. If you swing a 350 km radius from Olympic Dam the obvious alternative site is Ceduna. Even if SA could somehow acquire a new centralised power source and adequate transmission the desal could still be at Ceduna using all-electrical reverse osmosis. However my alternative proposal is this… go for broke on a west coast desal and generate all the needed power at Ceduna. This would not only replace the Artesian Basin water used by OD but also the water pumped 400 km from the River Murray to the east. That pipe carries up to 66 GL a year (180 ML/d) and pumps water via Pt Augusta to western towns, not quite to Ceduna but for example to Woomera only 70km from Olympic Dam. Note it is already proposed to augment some of that river water with the desal intended for Whyalla. A sufficiently big desal (say 400 ML/d) could replace all of the river water as well as the groundwater used by OD. Then there’s new mines and factories in the future. Based on the 400 ML/d Wonthaggi Vic desal that might consume up to 100 MWe of power if done by reverse osmosis with no thermal input. However there will be a power saving on the pumps on the River Murray far to the east which could be retired to standby mode. Thus the combined generating facility and desal at Ceduna would send both power and water directly to the mine. But what source of power? 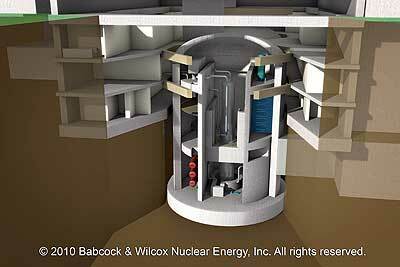 In my opinion it would be politically prudent to use small modular reactors perhaps optimised for desalination through a thermal assist or load switching. I defer to the wisdom of others on the specifics. The SMRs together producing 650 MW or more would be seawater cooled. While the electrical supply to OD would be initially private the additional regional water supply would be a public service. If that plant was Australia’s first commercial reactor it would ‘break the ice’ for nuclear in other parts of Australia. More importantly if it could be up and running trouble free within a few years it should get favourable media treatment. Once the site is bedded in I think there is every reason it could scale up to later gigawatt scale generation and a range of support industries. There are good reasons for expanding Ceduna if the money can be found. In the long run some have called for an HVDC cable across the Nullarbor to join the east Australian grid (Ceduna being its westernmost point) to WA at Norseman. 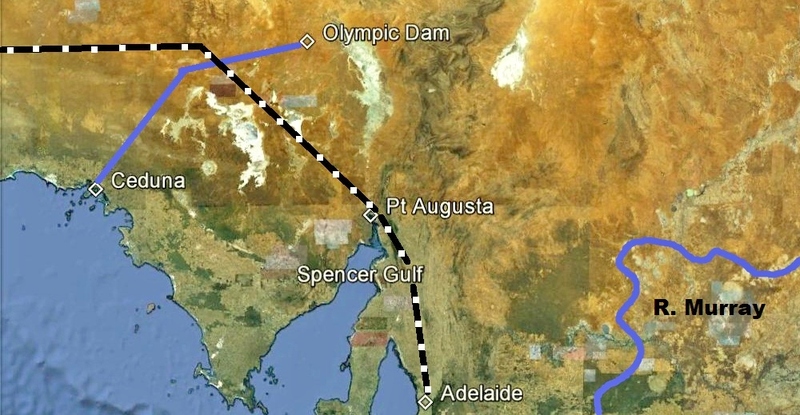 Logically the eastern end would be at Pt Augusta for which the transcontinental railway line provides a natural easement. That would be intersected by the power and water line from Ceduna to OD at which point an electrical node could be created. I suggest building the private grid first then think about the public grid later. An east-west electrical link might solve the peaking power problem if as predicted south eastern Australia’s gas situation becomes dire. Rather than pump physical gas the peaking power could come as electrons from WA through the cable. Even just with links to the east some have called for improved transmission to take advantage of untapped windpower potential. Whether that makes economic sense or not it does at least buy some support from renewables enthusiasts. Later the Ceduna energy park site could consider uranium enrichment advocated by some. That means we could home fuel 3rd generation plant like the AP1000 rather than import processed fuel. Interestingly Ceduna will also have thorium coming from all angles, from the monazite sand to the west, the Whyalla rare earths plant to the east and even the OD tailings to the north contain thorium, currently discarded. After an SMR beginning we could later on consider some form of large scale 3rd generation NP that can use thorium such as the CANDU. Or perhaps skip large scale 3rd generation and go straight to 4th generation technology like the IFR. If the choice means metallic thorium then that can be a new industry along with fuel reprocessing. In the rough map I’ve shown the approximate position of the rail line and the corridor to the coast but to avoid clutter I’ve omitted the current water and transmission lines. I’ve also avoided any discussion of the money side of things but I note the following caveats. Let us suppose none of this happens and we then ask how much have we saved. If the OD expansion uses a new gas fired power plant and gas becomes prohibitive that will be a costly mistake. Suppose they go ahead with the Spencer Gulf desal and the marine life suffers, a PR disaster. Another big mistake. Suppose they wait to build the first NP closer to Adelaide but protests and political interference turn the project into a nightmare lasting a decade or more. That could be the biggest mistake of all. It could work out quicker and cheaper to start small under compelling circumstances then build up. Just a preliminary comment on this: HVDC is great for point-to-point transmission but not for lots of connections along the way, due to the costs and energy losses of the DC-AC converter stations. However, a pure HVAC line to take advantage of wind would require synchronisation with not one but two grids. The solution would be to have AC-DC-AC converter stations at both ends of the line and run a 500kV minimum size line across the Nullabour. The problem with this of course is that you get the converter station losses of HVDC and the inductive losses of HVAC – a lose-lose situation. Other than that, I’d like to mention that there’s no planned CANDU SMR design which means that the only option for utilising Th-232/U-233 or other non-LEU fuel cycles will have to be a fast-breeder design like the IFR. Of course, if you’re building 6 SMR units of say 125MWe size (such as a B&W mPower unit) then a single Enhanced CANDU-6 might fit the bill anyway – if it has an enrichment plant and desal plant attached then the load-following issues (CANDUs can cycle down to 60% of power during normal operations) could be mitigated by simply using that load to chew up the ~440MW minimum output. Or you could export the power to the east into the NEM. When I wrote my energy plans for SA I too placed a focus on SMR build up rather than going with CANDU size. Perhaps the main useful information I have had from my engagement with South Australian politicians is just how price sensitive this small state is for new energy infrastructure. The advantage SMR brings in this regard is really, really attractive to the pollies. Based on the comments I received, I feel like this issue is a little under-appreciated by my readers, but it is a huge, huge issue. Technically, CANDU may fit the bill in a politically perfect world, but we do not have that by a long way!!! That is a great thought: a politically perfect world. What would it look like? As I slowly grow wiser, I’m more and more convinced that we get the politicians and the politics that we deserve. So I guess the politically perfect world is one where the rest of us actually have expectations for longer term thinking and reflect that in all the decisions we make. We would then earn leaders who do likewise. In answer to your question about being concerned – yes, we should all be very concerned that our political system has little to do with visionary thinking. It is about winning votes and not upsetting people. It is incapable of addressing the challenges of the coming century. We can’t vote for issues with our democratic system and the choices we have offer little choice for expressing our views or having informed decision making. Our political system in Australia may score 8 or 9 out of 10 in maintaining a stable economy, but in terms of responding to future realities of overpopulation, destruction of natural habitats, sustainability and limited resources it would score 2 or 3 at the most. The US would struggle to score 1. Much of the developing world would not score at all. China and India may score higher may score higher in at least starting to deploy nuclear power as a means of addressing climate change, or just their energy needs, but not very well in the rest. Good article. I note the references to remote areas, mines and desalination. However I’m not sure if any of the designs described have been NRC certified or are anywhere close to production. Other issues may be the weight and size of components that may have to moved by rail or ship then lifted by crane. If none of the designs has actually undergone a 10 year refuelling yet we don’t know if the process is cost effective and whether opponents could make it difficult. A key point about SMRs is not so much about levelised dollar cost but lowering the political hurdles. As I’ve noted to you privately John, we are pretty well on the same page regarding SA energy/water/infrastructure development. I had a piece published in the Adelaide Review in September 2009 outlining my vision for SA over the coming 30+ years. I shall be using it as part of my speech to The Retired Engineers Group in Adelaide on March 7th. I’ll be using material from my two Ockhams Razor talks as well. I’ve sent all three bits to: Martin Ferguson, Jay Weatherill, Tom Koutsantonis and Marius Kloppers. Pretty obviously BHP Billiton will be a leader in all of this development. And so Ben, would you like to put any/all of my pieces up on your blog for everyone to consider. I know I’m way ahead of the game bearing in mind that we still haven’t got the government to consider nuclear power but I believe we are getting closer. This pleases me greatly because it is now 14 years since I first started speaking for it. Anyway Ben, the offer is there if you’re interested. “Firstly a highly effective movement requires a critical mass. At the end of the day, a bigger movement of pro-nuclear environmentalists will be better. BUT it will not be better if the movement is made bigger by diluting the message and the values. Then, Decarbonise SA will have exchanged passion and commitment for numbers. That doesn’t work. Why? Because highly successful movements do have a degree of exclusivity. They are defined, at least in part, by who is not a member as much as who is. Movements are most effective when they can be clearly compared to the status quo, or to movements that try to push in the other direction (thanks again to Godin). How could I possibly call on people’s time, passion and enthusiasm in service of a movement that is populated by those with deeply different values? I wouldn’t do it. I don’t expect anyone else to either. It’s the reason I left GreenPeace and The Wilderness Society. There are some things Decarbonise SA will pointedly not do, and not become. Most of these points are in response to some issues raised here and particularly on the BNC thread. It will not be a friendly home for the airing of views by the many climate change deniers with whom I share an interest in furthering nuclear power. That their efforts may be complimentary to mine is not a good enough reason to dilute Decarbonise SA’s message. I can’t be much clearer than that. As one of the world’s wealthiest corporations ($23bn profit) I don’t see why BHP-B couldn’t put up a lot of the money for a nuclear facility. I believe in the early days they help fund schools in Whyalla before divesting OneSteel. As I point out the electrical grid may be private in the first instance but surplus desalinated water would go into a public water network. That gives rise to the possibility of joint ventures with SA Water while perhaps ETSA or Alinta may want some of the electricity business. I suggest the Feds could lend any joint venture a low interest chunk of the massive $36bn NBN budget. Terry I agree with Ben it’s best not to mix the nuclear message with climate change disagreement. Thanks Ben and John. Points taken. I’ll just keep on plugging away essentially on my own. I’ve been doing it now for 14 years. It seems that I’ll be getting a third go on Ockhams Razor later on. It’s been a tough ride I can tell you but I’ve made progress. Am speaking to the Retired Engineers Group on March 7th. That’ll give me a chance to convert another 50 or so to nuclear. It’s a pity they’re not a group of 17-30 year olds however. They’re the people I [and you] need. (I’m using this thread as a catch-all for the SA west coast) I think it is becoming clear that the powers-that-be don’t rally care about either long term South Australian jobs or the environment. The aim seems to be to dig up a resource and get other countries to do the value adding. If sensitive environments get in the way too bad. In all likelihood that iron ore will marry up with east Australian coking coal in Asian steel mills thereby avoiding carbon tax. This mirrors uranium in which the raw product (yellowcake) will be enriched and sold overseas. If Australia ever wants steel or enriched uranium made from our own raw materials we will have to buy them in at top dollar. We’re selling out, ruining our backyard and making ourselves dependent on others. We need to start asking hard questions – what exactly is preventing us from using our mineral wealth ourselves by refining it? That is to say, what on earth happened to our old manufacturing sector? Is the carbon tax going to be affecting manufacturing because of our use of coal? Is it because we aren’t putting a carbon tax on coal exports? Is it because we’re not putting export duties on raw materials that are being shipped out of the country like iron ore, coal, rare earth minerals and bauxite? Is it simply because Australian wages are too high for our productivity? Is it due to a lack of capital or investment in these industries here? Perhaps what we need to do is stimulate local manufacturing – placing ourselves in the supply chain for domestically-deployed SMRs would do that nicely, perhaps with trickle-down effects for allied manufacturing sectors. After all, if the car and aerospace industries claim that they should receive Government assistance because of this effect, why not build an entirely new industry with an objective that is much more beneficial to the environment as well? Note also as time passes new mines are canvassed as is regional demand for desalinated water. The angst over Muckaty NT for an N-dump also points to Woomera area as the logical alternative. 4) import more high carbon electricity from NSW and Qld. I recall former federal MP Alexander Downer said Australia deserved a carbon credit for uranium exports. Perhaps Aussies with their special needs and sensitivities could use that idea to justify increased emissions to power uranium mining. Otherwise there will be no expansion.